M is for MSLEXIA (‘for women who write’). I really like this magazine and have a subscription to it (ahem, please note photo of the last issue, received at least a fortnight ago, still in its plastic wrapper, because I’m waiting for that elusive chunk of time so I can enjoy reading it from cover to cover…). There’s plenty of free stuff (including writing exercises) on the website, if you want to take a look and I don’t think the internet will be able to tell if you’re a MAN! You see, in every class I’ve ever taught, there’s always a man who takes umbrage when I tell them Mslexia competitions are only open to women and that they only accept submissions by.. you’ve guessed it: ‘laydeez’. Is that right or wrong? I’m not sure (you tell me!) but there’s always a ‘game chap’ in my class who suggests he should enter one of the Mslexia competitions under a pseudonym! ‘Go ahead!’ I say. But at £10 a go, for the short story competition, for example, he might want to save his money. If he’s shortlisted – or actually wins – he’ll have to lie and disguise his voice on the phone and also possibly dress up as a woman to go to the meeting with an agent and the writer’s retreat, that are usually part of the prize. (The ‘game chap’ usually goes pretty quiet at that point). N is also for NANOWRIMO which I wrote about here. November will soon be upon us (sorry – after the summer, of course!) and I haven’t yet decided whether I’m going to do it or not. I may do, as I’m planning to free up some more time after the summer. Watch this space…! O is for OTHELLO – which I went to see at the RSC on Saturday night. It was really good (but hot!) and the most interesting part of the play for me was how Iago upstaged the hero. He has almost a third of the play’s lines (Othello only has a quarter) and although he’s an out-and-out baddie, he was funny and witty and the audience (not just me!) loved him. O is also for OPTIMISM. I truly believe that you have to be an optimist if you want to be published because, as well as talent and hard work, there’s definitely an element of luck in it. A new lady in my class last week, was complaining about a workshop she’d attended in which the tutor said it was practically impossible to be published and she’d let that discouraging comment put her off even trying for years. I couldn’t think of a good response at the time but now that I’ve mulled it over, I think: a) you’ll never know unless you try and b) the thing about writing is, you have to love it, you have to want to do it and publication should perhaps be an added bonus, not an end in itself. Most successful writers didn’t set out to be rich and famous, after all: they just wanted to write. This entry was posted in Magazines, Plays and tagged NaNoWriMo, Othello, RSC. Bookmark the permalink. Thanks for including optimism…..you need it when people say why are you writing another novel when you haven’t had the first one published! 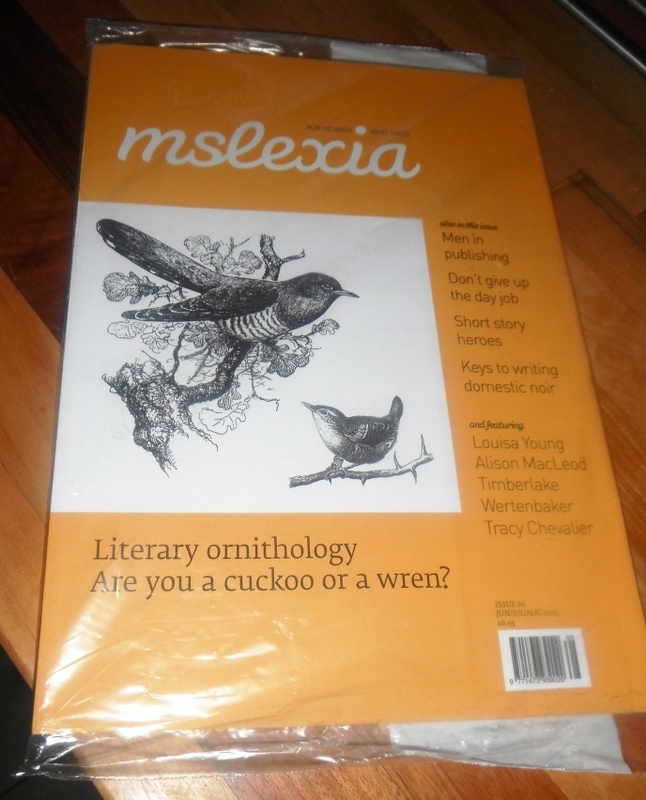 I used to subscribe to Mslexia (awful name, btw), but I couldn’t keep up with the reading. I appreciate its erudition, but it’s not for me. My M is Morgen Bailey’s Writing Blog, because it’s full of useful and interesting stuff for writers. She also does book reviews and the latest one is of Helen Yendall’s book ‘Paperchase’. I’ve done a course with Morgen and she really knows her stuff. N is for notebooks: need I say more? O is for opportunity: keep saying yes to whatever comes along. I subscribe to Mslexia for its interesting/ useful articles but it does annoy me that they restrict submissions to women. I’m all for equality, but you don’t achieve it by excluding half the population! Not sure yet if I should thank you for the link to Novelicious … just had a quick look and bookmarked it … but I suspect it might be very distracting. Congratulations on your shortlisting, Linda! And good luck for the final results – let us know how you get on! It was the Frome Festival comp and, no, I didn’t make it to the top 3. But reaching the shortlist of 13 out of over 450 entries still felt like an achievement. Onwards and (hopefully) upwards!